Russia and the Ottoman Empire fought a series of wars during the late 19th century, the last occurring between 1877 and 1878. 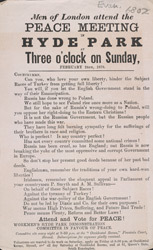 British public awareness of the war had been aroused over atrocities committed against Christians during the early stages of the conflict. In March 1878 Turkey agreed to the Treaty of San Stefano, which created a new Bulgarian state with its own government and army. The war, however, was not over, the British and French governments were concerned about the extent of the Russian success and compelled Russia to accept more limited terms of expansion under the Treaty of Berlin.